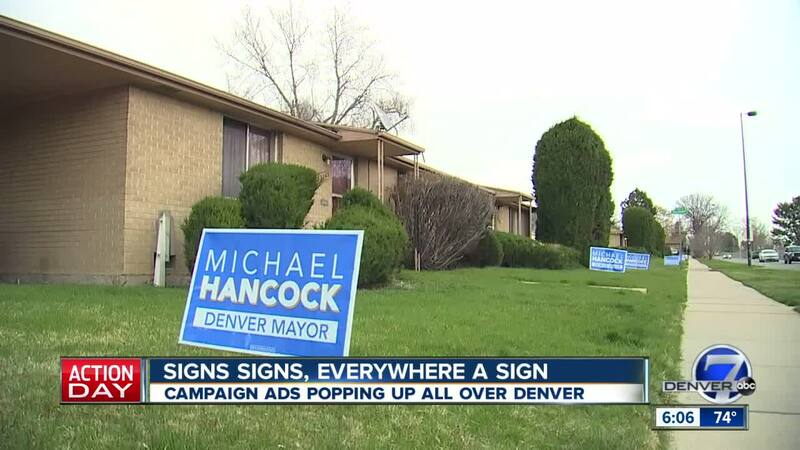 DENVER -- Campaign signs for the Denver mayor's race are popping up all over the place, including where they don't belong. Contact7 is following a trail of signs that have gone up without permission. "One morning we woke up, and there were like 20 signs down the street," said Ravina Williams, who lives along Colorado Blvd. near 29th Ave. The issue for Williams is that no one in her family ever gave Mayor Michael Hancock's reelection campaign permission to put the signs here. "I think it's rude,” Williams said. “Because nobody asked us, and it only takes one sign. You don’t need four signs in one yard." Williams says not only is it excessive and wasteful, but no one ever got permission. "They don't know who you're voting for, but they just put them in your yard," Williams said. Every house on her block had at least one Hancock sign on Tuesday morning. “You can’t tell me that every single person on this block is voting for him,” Williams said. Elisabeth Teater said someone's illegally planting signs in her neighborhood, too. "On our block, there were five different Michael Hancock signs - all in yards of either vacant houses or houses that were for sale," Teater said. Contact7 checked Denver's municipal code. It's a violation to place signs where they're not allowed. They're being placed in public right of ways, which is against the law. And, in some instances – in front of affordable housing, like the home the Williams family lives in. "It's too much and no one asked me," Williams said. "I think it's really disappointing for me because his slogan is 'We are all Denver,' and this seems just like a clear (case of) taking advantage of people," Teater said. For mayoral candidate Lisa Calderon - it's getting personal. She snapped a photo of one of her signs covered up by a Hancock sign. "It's incredibly frustrating as a grassroots candidate,” Calderon said. “We don't have a lot of money, so all of our signs matter." Contact7 reached out to the Hancock campaign. "It sounds like we have a very enthusiastic supporter or volunteer out there," said April Valdez Villa, a spokeswoman with the Hancock campaign. "But it does present an opportunity for us to talk with our staff, volunteers. That sign placed over Lisa's is especially disappointing. It's rude and sincerely should not have happened. That's not the kind of campaign we're running, and I hope that this is the last of that behavior we see." It’s an issue that has left many questioning if the mayoral campaign is a level playing field. "Just because you're in power, because you think you're above the rules - um, it's just not fair," Teater said. Valdez Villa says none of this was purposeful or mal-intended. But, others still question the tactics. "And why would you want to win by cheating?" said Teater.